Devilled kidneys on toast is a simple English classic, which done well delivers a deep satisfaction. And I am pleased to report the team here in this dreamy Cotswold getaway are very much in the business of customer satisfaction. Served as a starter for the extreme trencherman (guilty as charged) or breakfast, the way this dish is presented told me a lot about the philosophy of owners Sam and Georgie Pearman. The courtyard and garden at the Wheatsheaf Inn offer plenty of secluded tables to enjoy a drink or lunch. It’s about delivering timeless classics in healthy portions and using the very best ingredients. And all in the relaxed surroundings of a former coaching inn which has been imaginatively restored for the 21st century hotel guest, using a blend of original features and modern creature comforts, including Bang & Olufsen televisions with Sky Sports in the bedrooms. Our room in the courtyard featured a huge double bed and a bathroom with a roll-top bath, power shower and plenty of original Cotswold limestone on display. 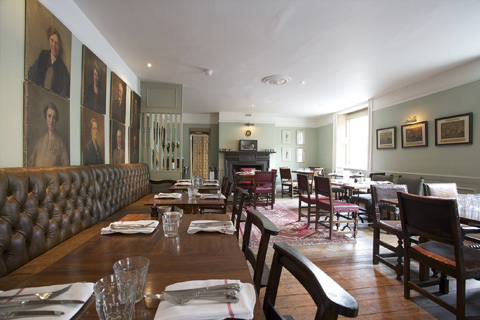 Beyond the public bar and dining room there is a perfect private dining room, decorated with plenty of roebuck heads and more exotic trophies from further afield. 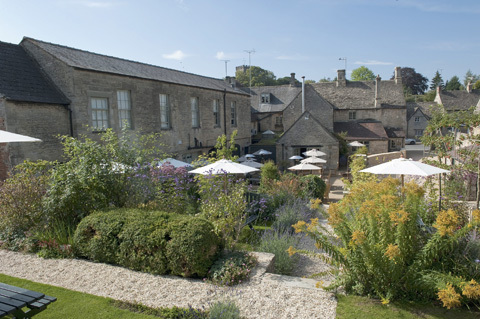 The garden is a well-designed space perfect for lunch or a pre-dinner drink, with the courtyard bar providing a genuine party atmosphere on a warm evening. The courtyard bar is where the party is at in the summer months. With 14 bedrooms there is more than enough space for your shooting team, and with regular game nights and shooting people on the staff your needs are well understood. Dogs are welcome in the easily accessible courtyard rooms and there are plenty of shoots nearby, not least Salperton Park. Ian Coley Shooting Ground is just down the road too if you need some practice. The Pearmans are developing a small chain of pubs and hotels in the area and, if the Wheatsheaf Inn is anything to go by, the others will be well worth a visit. The only problem with an expanding small chain is ensuring all the staff have the right training to deliver the admirable message of the owners. Cost of a double room at the Wheatsheaf Inn: All rooms for £130 per night, Sunday to Thursday, in September. Shoots close to the Wheatsheaf Inn: Salperton Park, Stowell Park and Ian Coley Shooting Ground. The Wheatsheaf Inn contact: 01451 860 244 or visit www.cotswoldswheatsheaf.com.